Photo courtesy of zimbio.com. In a jersey, all Michael Jordan (pictured above) could do was win. In a suit, all he has been doing lately is lose. Once upon a time Michael Jordan and the word “winning” were synonymous. Everyone wanted to be like Mike. There truly was not a more well-known athlete. Since the turn of the century, times have really changed for “His Airness.” The post playing career has not exactly been one of triumphs and successes for the man commonly referred to as the GOAT (Greatest of All Time). 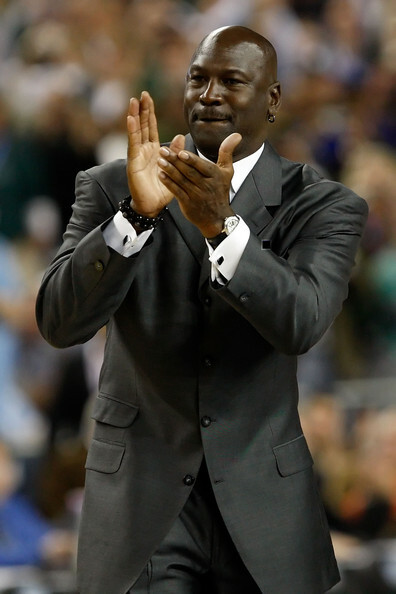 Jordan, the current majority owner of the Charlotte Bobcats took another loss last evening. After posting the worst record in terms of NBA history in terms of winning percentage, the Bobcats got the shaft in the 2012 NBA draft lottery. They will not get to build their team around can’t miss prospect, Anthony Davis. Instead, they will be saddled with pick number two. Though there are plenty of talented players that will be drafted on June 28th, none even rival the potential possessed by the one with the infamous unibrow. Ironically, the team with the NBA’s worst record has not won the draft lottery since back in 2004 when the Magic earned the right to draft Dwight Howard. That marriage continues to get sweeter and sweeter (just kidding). Photo courtesy of zimbio.com. Little known Virginie Razzano shocked Serena Williams (pictured above) in the opening round of the French Open yesterday. Photo courtesy of zimbio.com. Rafael Nadal (pictured above) is looking to make history in Roland Garros with a seventh French Open title. Paris. 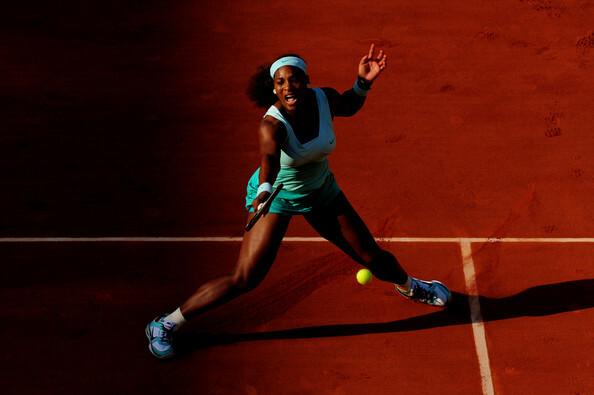 Roland Garros. Philippe Chatrier. It is time for the year’s second Grand Slam. Though this is not typically a favorite tournament for Americans (last Men’s winner was Andre Agassi in 1999, Women’s winner was Serena Williams in 2002), people love parity in sports. This is the closest thing that the tennis world has to March Madness. Before Rafael Nadal came along as the “Clay Court King,” the French Open had nine different men’s champions in a ten-year period. 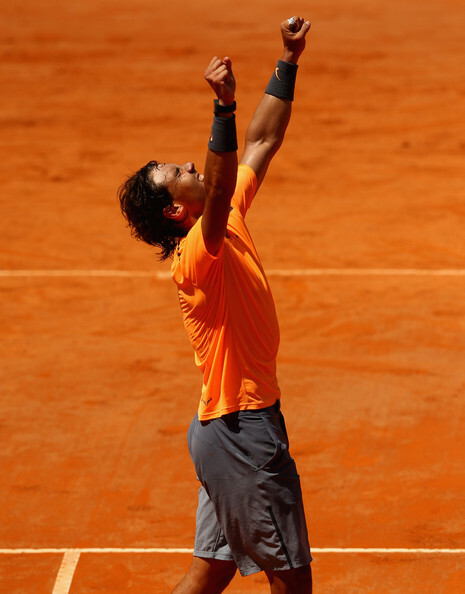 Despite Rafa’s dominance, this tournament is always scintillating as the clay court specialist come out in full force and enjoy their time in the sun. On the Women’s side, there have been four different winners the past four years. Strap in, and get ready for a little taste of Paris. Photo courtesy of thevictoryformation.com. 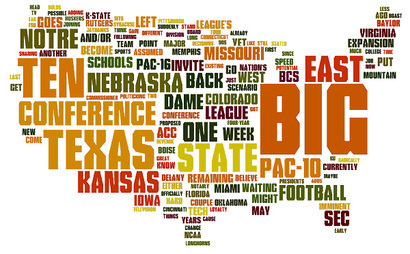 Our very own Nick Craddock gives his thoughts on NCAA Conference Realignment. There are college football dudes and college basketball guys. I’m more of a college basketball guy. I suppose it’s part of my genetic makeup, like it was in my Canadian forefather, Dr. James Naismith. But now, conference realignment is becoming downright cumbersome as it seems to be forcing me to cater to college football at the cost of quality collegiate hoops from top to bottom of Division I.
I’m not naïve enough to think that the NCAA is not (at least in part) driven by making money and although I was unhappy with the first wave of conference realignment in the fall (i.e. the one where Boise State became a member of the Big East among other moves where the major conference poached teams from one another), the desire for BCS schools to ensure their BCS Conference auto-bid status, lock up lucrative bowl tie-ins, and find the best television markets and contracts was rational. Photo courtesy of zimbio.com. The point guard matchup in the Western Conference finals between Russell Westbrook (pictured above) and Tony Parker should be one for the ages. Let’s not beat around the bush. The Western Conference semifinals were a major bust. The city of Los Angeles (Clippers and Lakers) was entirely overmatched and mustered up one total victory. Now, the matchup everyone has been waiting for in the Wild Wild West is set. 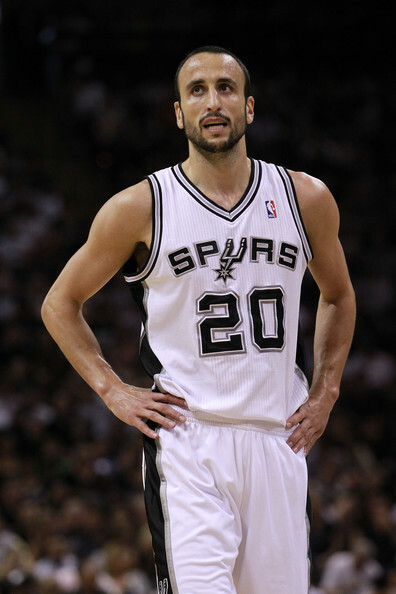 Who isn’t excited for the Spurs/Thunder showdown set to start on Sunday? Not only did the supposedly “over the hill” San Antonio Spurs tie for the best record in the NBA, they also have won 18 straight games. 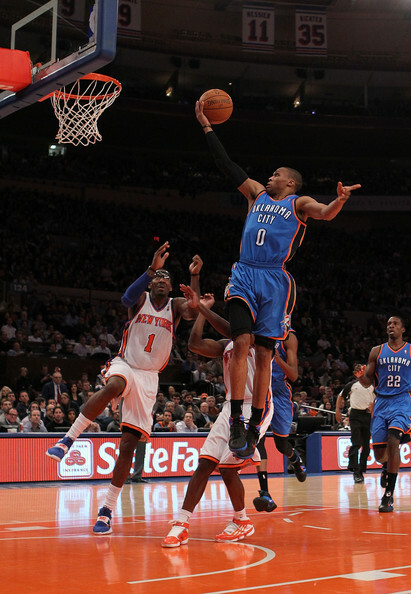 The Oklahoma City Thunder are coming off an emphatic thrashing of the Los Angeles Lakers. OKC has been the favorite all year long out West, and lived up to the part until the final couple of weeks of the season when San Antonio leapfrogged them for the number one seed. So despite San Antonio possessing the number one seed and cruising through the first two rounds, all records get tossed out the window. The score is 0 to 0 come Sunday. Not only did the Spurs and Thunder finish 2nd and 3rd in the NBA in terms of scoring offense this season, they also finished 16th and 17th in terms of scoring defense. These teams put up frighteningly similar statistics during the course of the 66 game shortened season. Can you say seven game series? Photo courtesy of zimbio.com. With the arrival of Mark Lyons (pictured above), the Arizona Wildcats are not only a favorite to win the Pac-12, but they are also a contender to make a deep run in March. Now I already know what you all are thinking. Who isn’t already keeping an eye on the Wildcats when it comes to college basketball? Calipari’s “Traveling All- Stars” have appeared in two consecutive Final Fours and of course cut down the nets in April. I am not talking about Lexington’s Wildcats though. I am referring to the Arizona Wildcats. So the Pac-12 this past season in terms of hoops was an utter embarrassment. The Washington Huskies took home the dubious honor of becoming the first team in the modern era of the NCAA tournament to win a power-conference regular-season championship and not receive an at-large bid. Well that was the past. The Pac-12 will be far stronger during the 2012/2013 season in large part due to to two familiar faces: UCLA and Arizona. Today though, I am focused on Lute Olson’s former employer. After a disappointing season in which they lost in the opening round of the NIT, the expectations are once again high in Tucson. First of all the Wildcats are led by one of the best coaches in America that is still flying under the radar, Sean Miller. 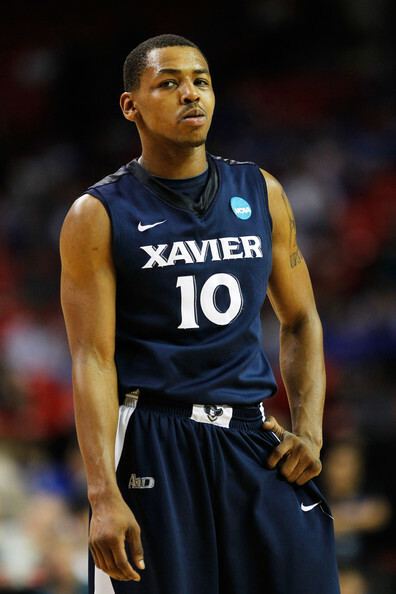 Miller is another coach that was produced from the coaching gold mine that is Xavier University. This guy did a remarkable job in leading the Wildcats to the Elite Eight in 2011 and helping mold Derrick Williams into a lottery pick. Things looked bleak for Arizona though with the transfer of point guard Josiah Turner. In actuality, things just got a whole lot better.